In the film, Lady Gaga’s character falls in love with an ageing rocker (played by Bradley Cooper) who just happened to launch her successful career while his own career continues to decline. Coachella concertgoers were notified by text message that they could possibly be filmed for the musical, which is also being directed by Bradley Cooper. 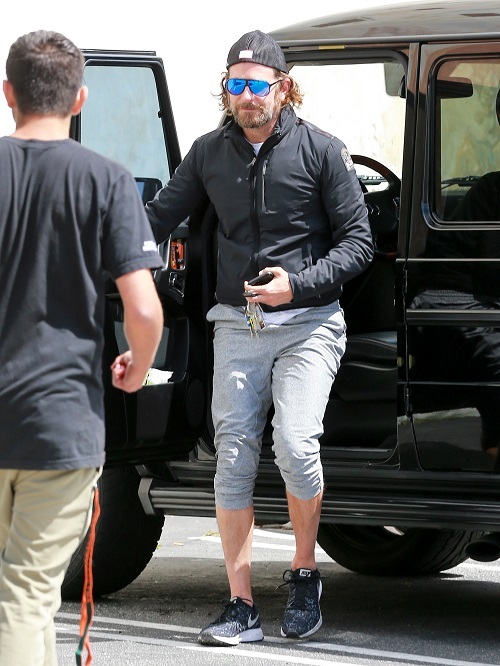 Clearly, Bradley Cooper’s career is hot in Hollywood right now. While he’s in Coachella filming with Lady Gaga, Irina Shayk is back at home taking care of the couple’s newborn daughter, Lea de Seine Shayk Cooper. Sure, new dad Bradley probably wants to be at home with his family right now, but his work obligations are obviously more important. Even though both Bradley Cooper and Irina Shayk are high-profiled names in the entertainment industry, they are a very low-key couple. They first met back in 2015 on a date to the Broadway show, ‘Finding Neverland.’ Since then, they’ve done everything in their power to stay under the radar. It’s very doubtful that Bradley will open up much about his new life as a father. Unlike other celebrities, he never talks about his personal life with the media. In fact, he wouldn’t even confirm his relationship with Irina Shayk for the first several months of their romance. Considering how fiercely private Bradley is, there’s little chance that the public will see photos of his newborn daughter as well. Unless, of course, Irina shares them with the world on her Instagram account. Time will only tell if Bradley and Irina will make it as a couple or even down the aisle for that matter. A lot of fans are surprised that he hasn’t proposed to the Russian supermodel yet. After all, she’s just given birth to his first child. There’s a strong possibility that Irina wants Bradley to make things official between them, especially now that she’s a mother. So far neither Bradley Cooper nor Irina Shayk have made any comments about their daughter of their future plans for that matter. Check back with CDL for all the latest news and updates on Bradley Cooper and Irina Shayk right here!